He was perhaps the only bishop who was not a member of the Patriotic Association, although he was recognized by the government. In 2005 he was invited to the Synod on the Eucharist, but the government did not allow him to attend. He spent over 20 years in forced labor camps. His praise of the Letter from Benedict XVI to Chinese Catholics. Since the beginning of the year his health had deteriorated. Funeral will be held on 25 November. Fengxiang (AsiaNews) - Bishop Lucas Li Jingfeng, bishop of Fengxiang (Shaanxi) died this morning at 7.20 am at the age of 95. He had been sick for a long time. Bishop Li was famous in China because he was the only bishop of the underground community to join the official Church without becoming a member of the Patriotic Association. He was also famous in the Vatican: in 2005 he - along with three other prelates - had been invited to participate in the Synod on the Eucharist. The government did not give him permission to leave China. On the occasion of the 2012 Synod of New Evangelization, he wrote to the fathers gathered at the Synod, describing how the faith of Chinese Catholics would "console the pope" because "our Church is faithful despite 50 years of persecution". Msgr Li was born in 1922 in Gaoling County (Shaanxi) into a deeply Catholic family. Of the eight children, all expect one chose religious life. He became a priest in 1947 and covered various duties in the diocese. In 1959 he was arrested and sentenced to forced labor, from which he was released only in 1980. On 25 April of the same year he was ordained auxiliary bishop of Fengxiang by Msgr. Zhou Weidao. In 1983 he became an ordinary bishop of Fengxiang. Until 2004, it was perhaps the only diocese of People's Republic of China where only the unofficial Church existed, not recognized by the government. In the summer of 2001, an Office for Religious Affairs was opened in Fengxiang with the purpose of registering Catholics in the official Church and making them all members of the Patriotic Association (PA). 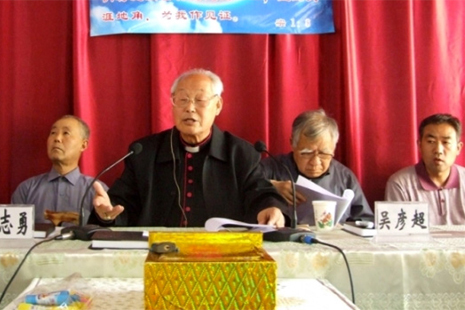 In November 2001, the diocese was subjected to a harsh repression by Chinese authorities, who ordered "raids" on convents and parishes in the area. Msgr. Li disappeared for a few weeks to be indoctrinated on Chinese religious activity regulations. In 2004 the bishop was recognized by the government as an official bishop, but without being forced to join the PA.
His commentary on the Letter to Chinese Catholics, written by Benedict XVI in 2007, remains a memorable one, which he considered important for Catholics, to foster greater unity, and for the government, to help them understand more the reasons of the Catholic Church. The diocese has been led by a new bishop for the past two years, Msgr. Peter Li Huiyuan. The funeral of Msgr. Li Jingfeng will be held on November 25th. A young Catholic, who is called "The Lord's Little Lamb", paid the following tribute to the last days of Msgr. Li. Our Lao Zhujiao (Elderly Bishop), Lucas Li Jingfeng, had been in poor health since early this year. He had been in and out of hospitals in the past months. He suffered from a brain hemorrhage and lung infections. The inflammation of the lungs remained there, not cured. When I visited Lao Zhujiao in recent weeks, he could not speak, but still tried his best to raise his hand to bless whoever who walked near him. He was weak, and had no strength. In my last visits to the prelate, he was fragile and had no more strength. But one instance amazed me. As he appeared to have lost all his strength, I placed a cross in his hand. To my surprise, he had slowly raised the cross to his mouth and kissed it. Also, his lungs were seriously infectious. His doctor inserted a tube for food into his esophagus to avoid drips getting into his lungs. One day, I was carefully dipping water drops to moisten his lips and mouth. Unexpectedly a water drop got into his throat, and he caused violently. I was so scared that it might aggravate his illness, and dare not touch his dry lips. However, when we delivered the holy communion and holy blood for him every morning, he was calm and did not cough. He was clear-minded. We were happy our beloved bishop had received holy blood at 6:50 am this morning, before he departed at 7:20 am. In the prayers of priests and the faithful, our Lao Zhujiao rested in peace!